A duo with a difference. Without a guitar or piano BOP presents a more modern sound. Jazz and latin, laid back, upbeat and everything in between. 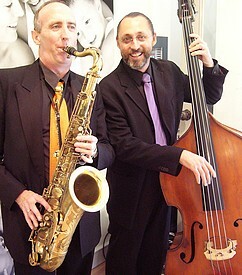 Featuring Steve Arie on Double Bass and Paul Cutlan on saxophones and flute, this inventive duo accesses a range of diverse musical styles in the presentation of otherwise well known jazz and latin standards from past to present. BOP draws from musical sources as diverse as Rodgers and Hart, Gershwin, Penderecki, Mingus, Webern, Parker, Crumb, Dolphy and Stockhausen to turn classic tunes inside out and has performed at venues including Brett Whitely Studio, Side On Cafe, Soup Plus, etc.